Unidentified group seated on lawn, c.1900-1905. Lantern slide (83 x 83mm) by unknown photographer. Image © and collection of Brett Payne. Summer means picnics and there are plenty of themes to choose from here, if you are an SS themer (not compulsory). You can home in on the details: teapot, primus stove, chicken, straw hat, blanket, shy girl, garden, or just delve into your albums for a picnic-pic. 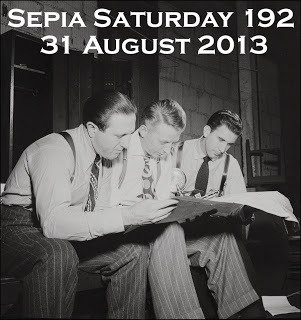 I asked regular contributor Brett Payne, for permission to use this image, when I spotted it in his response to SS 185. 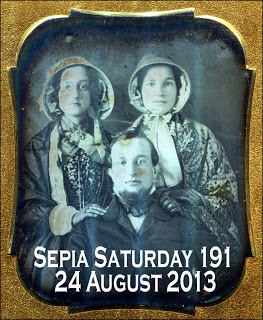 We're keen to use Sepians' own images as prompts where possible, so if you have one you think would fit the bill, let either Alan or me know. We used the other image of Brett's from that same week, as a caption competition on our Sepia Saturday Facebook group page. We have a lot of fun there too and we welcome requests to join from Sepia Saturday contributors. When you've published your post on your own blog, somewhere around August 17, don't forget to add the link to your actual post (by clicking on its title within the post and then copying the URL which this generates) to Mr Linky, and then leave a comment below. 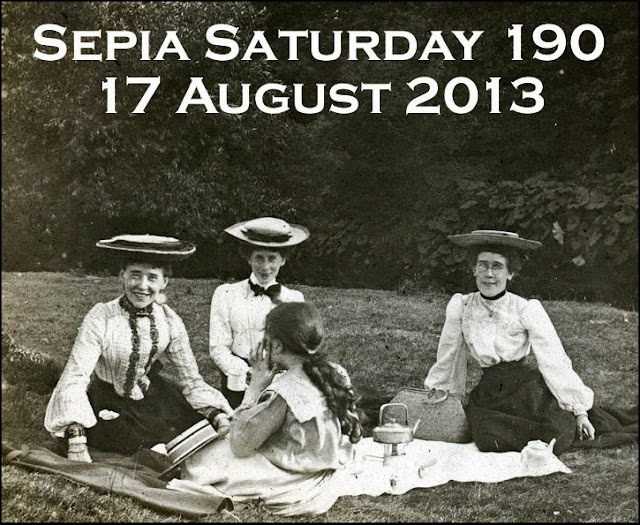 Please link back to this Sepia Saturday page, and there is a mini-banner to add too if you choose. Complete this whole enjoyable experience by visiting as many other contributors as you can. If the mood takes you, leave them a comment as well; we Sepians thrive on comments, and being a courteous bunch we will try to return the favour. Now before you break open the ginger beer and uncover the cold meats, whet your appetite first with a few hors d'oeuvres. You can chew over these in the coming weeks. 191 : A man and his sisters, his two wives, or is it one of each? Groups of three come to mind or how about gloves, shawls, bonnets or penetrating gazes! 192 : Over the years we have featured all manner of items of dress - hats, boots and most things in between. But now is an opportunity to look at the humble necktie and the smart suspenders (braces). Many thanks Brett for the use of your image; I'll save you a Scotch Egg! Oh, the 17th. Perhaps I posted a bit too early? I am always intrigued when I see hats, love wearing them myself, my favorites being my berets. Sorry this is a little early too, but since I've done the post I may as well link it up. We take photos so readily these days, but they are often of little significance compared to the depth of meaning that you can see in older photographs. Early this week as I had an 'office day'. Something to puzzle over. I was ready for a cup of tea after writing this. The layout of photos and text looked great on the draft, but for some reason, it went all awry once published and I could not correct it. I have linked mine to this photo by a fine thread..... They are in parks!!!! I have some uninvited picnic guests in a park. As long as I have something wet to wash it down with, Marilyn. Tea, or something a little stronger? Nothing like a picnic. I know the ants are in there somewhere. I think I've ticked every box and could have done so many times over - so hard to choose. I've earned my Friday night drink now! A bush picnic with a tennis game, including chicken wire as my chicken link. I hate when I have pictures but don't know the story. Oh well, can't win 'em all. No picnic for me... I've posted something I wanted to post two weeks ago! I didn't manage to get round everyone last week. I'll try to do better this time. At least, as far as I know, I don't have a picnic to go to. My picnic shot survived my struggles with Google Chrome. It lets me post now, but changes my typeface automatically and does other unpleasant things. I'm working on it. Happy weekend to all! The mistakes of my youth come back to haunt me this week. I went off on a tangent about how I watermark photos and why. What, a Sepian went on a tangent??? How shocking, haha. How about a picnic in the park with a prize winning brass band for entertainment? One of my favorite shots from my collection I gladly share with fellow Sepians. Going off on my own tangent this week!! Just a bit of architecture. A little short on picnics, but I found a vague connection. Love the ladies in their hats. Picnics are a likely place for the family camera to turn up. Thanks for the inspiration. My post takes me back to the days long before I was ever thought of, when my parents, grandparents and great-grandparents enjoyed picnicking together. Couldn't find anything picnic related, so went for ladies in hats instead. I couldn't resist posting about picnics! A bit late. A cookout, cousin to a picnic. Always on a Sunday. Some things never change. Running late again, my picnics post is a two-for-one with Trove Tuesday.